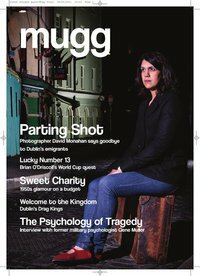 mugg is a new Irish magazine pooling the talents of a diverse mix of journalists. The features based publication is a mixture of lifestyle, sport, arts and culture and fashion. mugg‘s strong images, incisive writing and compelling content makes it an exciting addition to the magazine world. This website aims to show you a little about what we do at mugg magazine and for us to update you with news and events. It is entirely interactive so we appreciate all questions or comments.